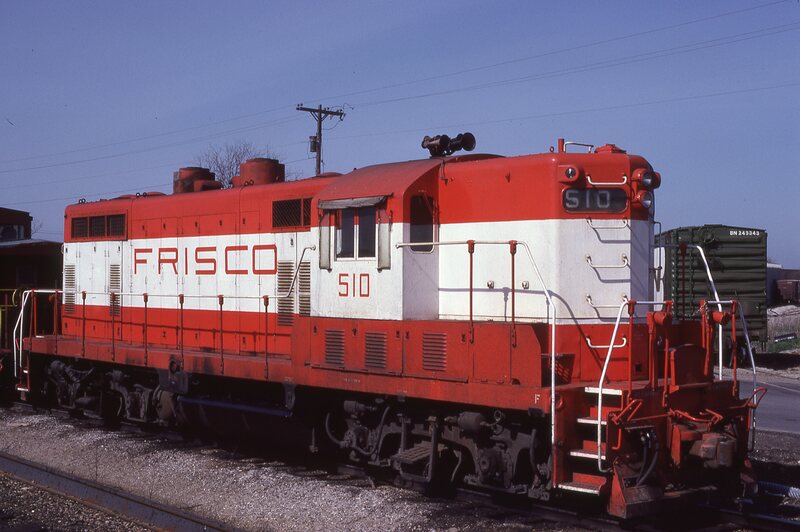 SW1500 352 at Springfield, Missouri on August 30, 1980 (P.B. Wendt). 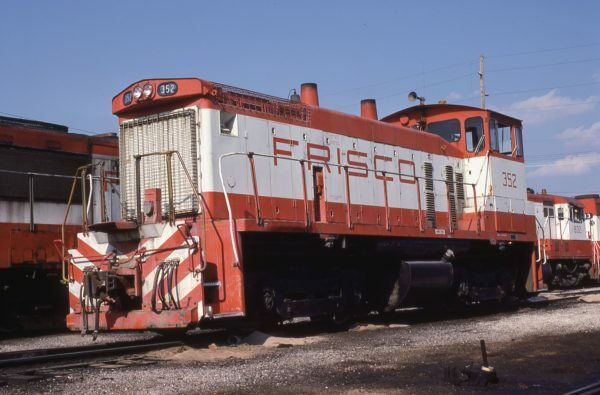 GP7 510 at Lenexa, Kansas on April 22, 1979 (Jim Wilson). 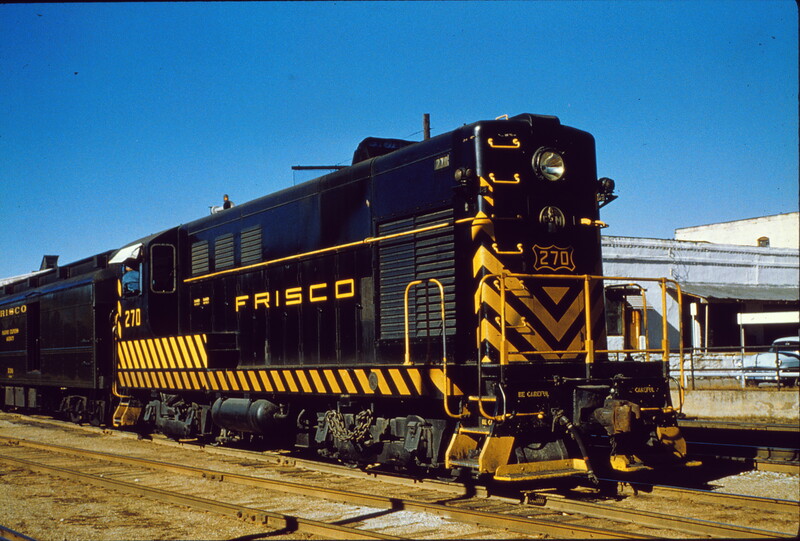 H-10-44 270 at Tulsa, Oklahoma in November 1961 (Trackside Slides). 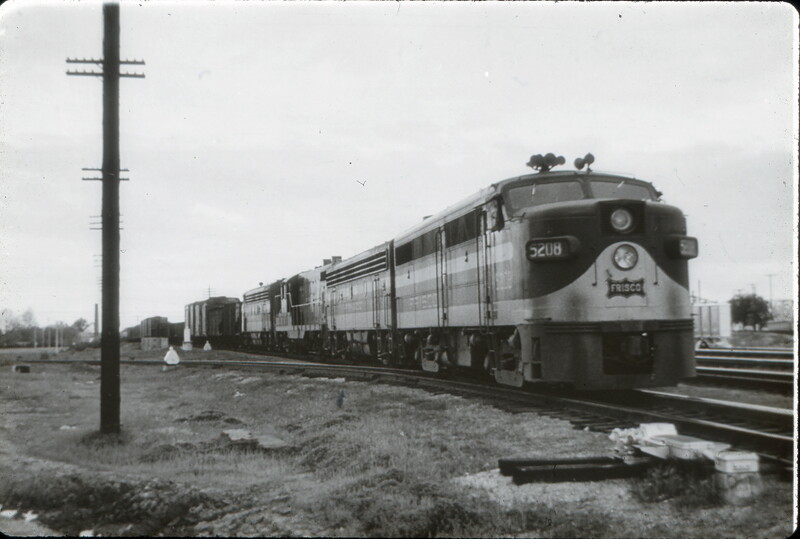 4-8-2 4402 at the Monett, Missouri Roundhouse (date unknown). This locomotive was Frisco-built. 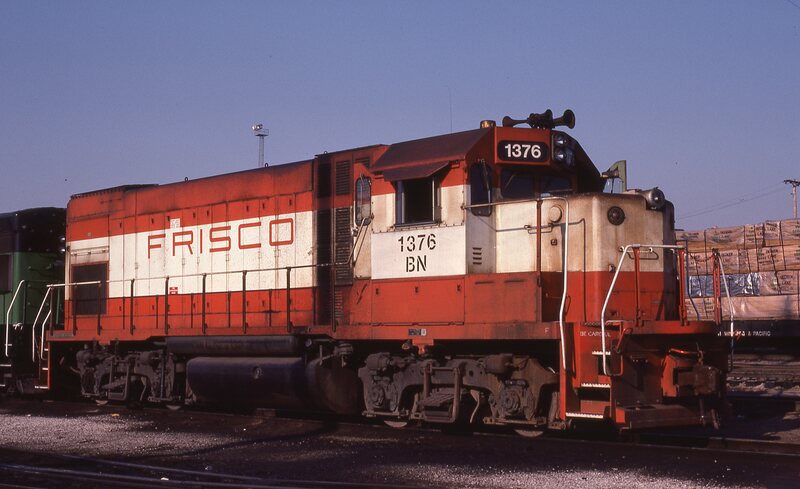 Also visible is 2-8-0 1317 (Schenectady Locomotive Works). 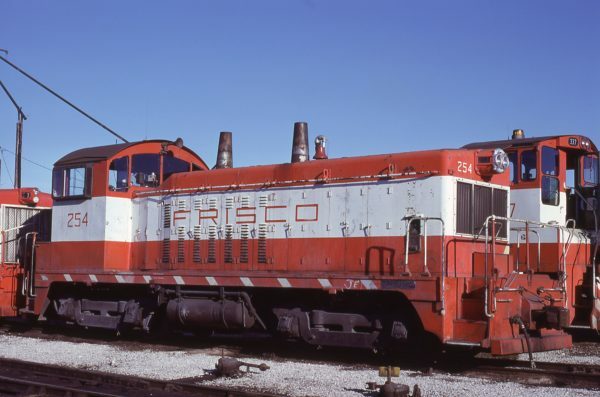 NW2 254 at St. Louis, Missouri in January 1981 (Lon Coone). 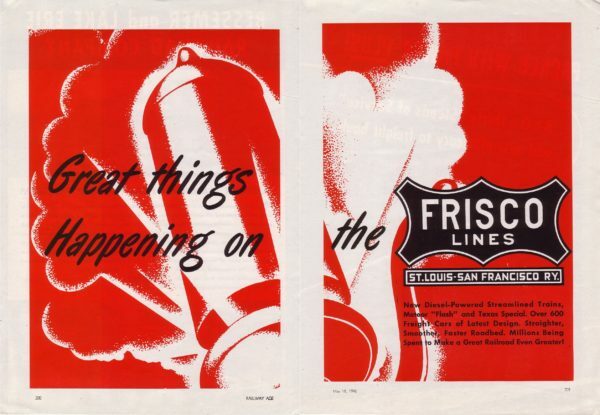 Double-page advertisement from Railway Age on May 18, 1946. Caboose 1212 (date and location unknown). GP15-1 1376 (Frisco 101) at St. Louis, Missouri on June 28, 1981 (M.A. Wise). FA-1 5208 at Memphis, Tennessee (date unknown) (Charley’s Slides). The train is southbound on the Memphis Subdivision. 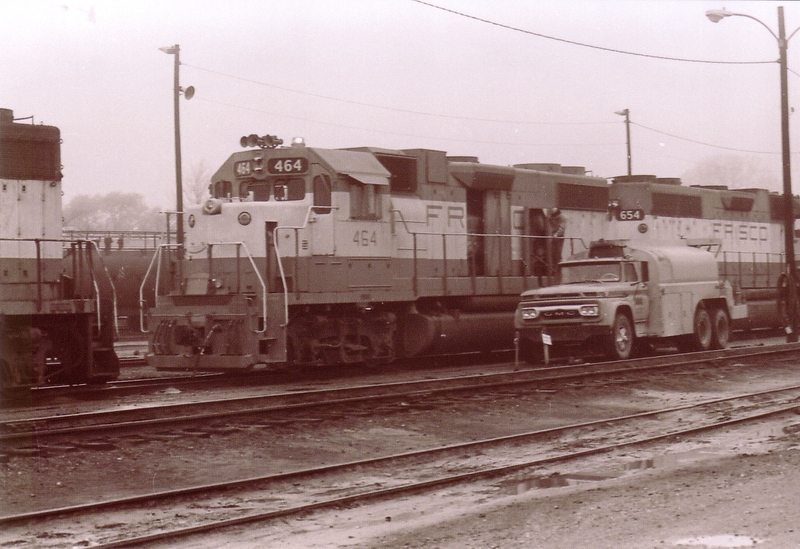 The locomotives have just crossed over the Illinois Central (IC) at mile post 483.8 (MP 483.8). 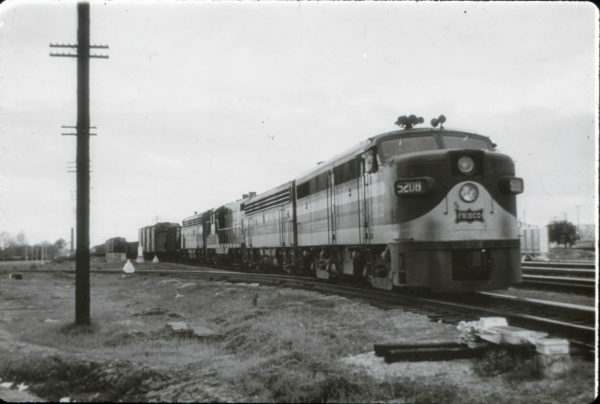 This crossing is just South of Memphis Central Station owned by the IC and host to passenger trains of the Frisco and Rock Island. At this point the train is on “Broadway”. “Broadway” is a 2.8 mile East/West corridor of multiple tracks for various railroads extending from the two railroad river crossing bridges (Frisco and Harahan) east to KC Junction. KC Junction lies between Interstate Highway 69 (I-69) to the West and South Waldran Boulevard to the East. At KC Junction the eastern railroads (Nashville, Chattanooga and St. Louis (NC&SL)–Louisville and Nashville (L&N), Southern (Sou), Union Railway (URY)/Missouri Pacific (MOP)) diverge to their individual routes and yards to the Northeast, East and the Frisco to the Southeast. In the distance to the right of the nose of FA-1 5208 one can see the three parallel, through truss, major bridges crossing the Mississippi River. On the North (upstream) side is the Harahan Bridge (CRIP, MoP, SSW). It has double tracks, is 4,972 feet long and was opened on July 14, 1916. On the South side is the Memphis & Arkansas Bridge (“old highway” bridge). This is the most southern of the three bridges, is four vehicle lanes wide, 5,222 feet long and was opened on December 17, 1949. Sandwiched in the middle between these is the Frisco Bridge. It has one track, is 4,887 feet long and opened May 12, 1892. 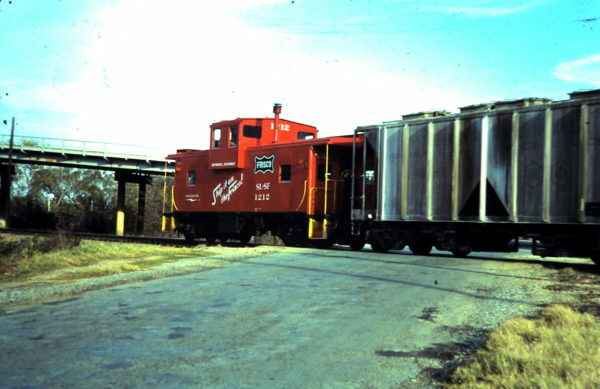 When completed by the Kansas City, Fort Scott and Memphis (KCFS&M) Railway it was the first bridge crossing of the Mississippi River at Memphis. 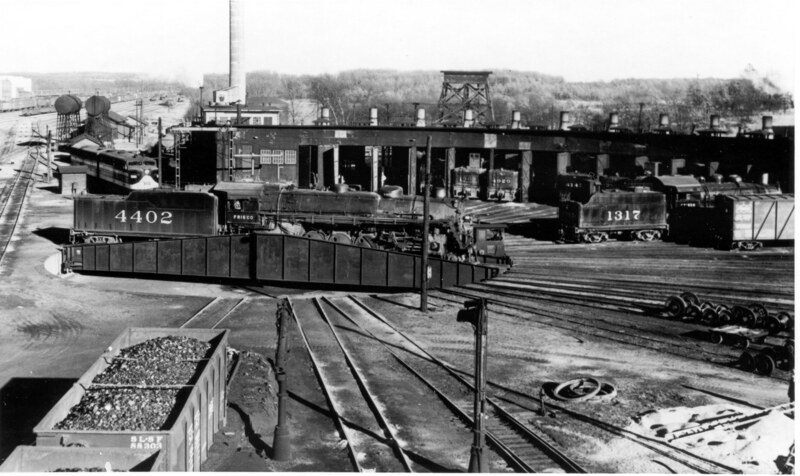 To the left of the train, near the second and fourth locomotives, are the backs of ground level triangular dwarf signals. Above each is a small round cast metal sign, when viewed facing the signal front, with the letter “A”. The “A” designates these as Absolute “stop” signals. Leading wheels must not pass the signal unless a proceed indication is received or authority is granted by the dispatcher or operator.